Thank you for choosing the Powassan Dental Centre . We have created a comfortable environment for you. Are you a new patient? Let's make your first visit as easy as possible. Your initial exam, or Complete Oral Exam, will last approximately one hour. This visit will help us get an understanding of what your dental needs are. Generally, X-rays (all our x-rays are digital) will be taken, allowing your doctor to examine teeth positioning and any areas of tooth decay. In most cases, a dental cleaning visit will be scheduled at the same time as your new patient exam. Call us directly to book an appointment , at (705) 724-2900. We ask that you come five minutes early, with your completed Patient Information form. Your initial exam, or Complete Oral Exam will last approximately one hour. This visit will help us get an understanding of what your needs are. Generally, X-rays (all our x-rays are digital) will be taken allowing your doctor to examine teeth position and any teeth decay. In most cases, a dental cleaning visit will be scheduled at the same time as your exam. A bridge is a fixed dental restoration used to replace a missing tooth by joining an artificial tooth permanently to adjacent teeth or dental implants. Types of bridges may vary, depending upon how they are fabricated and the way they anchor to the adjacent teeth. Composite (plastic) resins are matched to be the same color as your teeth and therefore used where a natural appearance is desired. The ingredients are mixed and placed directly into the cavity, where they are hardened by light curing. Our office does not use amalgum (silver) filling material. 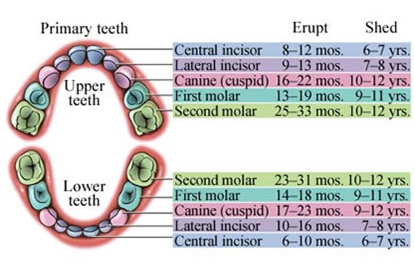 The tiny grooves in your child's back teeth are ideal places for cavities to form. But you can take a proactive role in preventing this with dental sealants. These are protective plastic resin coatings placed in these tiny pits and fissures of teeth, actually sealing them from attack. It's a wonderful method of decay prevention . Root Canal Treatment is a dental procedure to fix a tooth by removing the pulp chamber of the tooth and filling it with a suitable filling material. 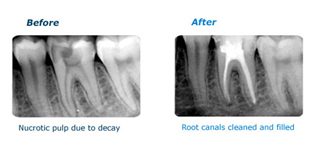 A root canal is usually performed when the tooth cannot be filled or restored any other way because the decay has reached the nerve of the tooth or the tooth has become infected. Teeth Whitening by bleaching is a successful, conservative, relatively inexpensive and Safe treatment with few side effects. We understand that bright smiles are important to everyone, but believe that patient safety is the most important aspect of any dental procedure. Our home bleaching system usually only takes 1-2 weeks to achieve maximal results, but allows the patient to control how much or little bleaching is done each time. At home kits are a common choice because these systems are easy to use and are a less expensive alternative to professional bleaching. Home bleaching requires a longer contact time compared to professional bleaching, however the results are still safe and are often quite good. 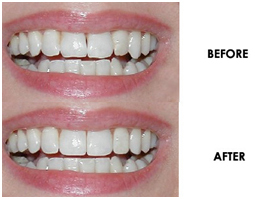 Book an appointment to find out if professional whitening is a good option for you. most people can benefit from teeth whitening, however, sensitivity is a commonly cited effect that some individuals are more susceptible to than others. Bruxism is the excessive grinding of the teeth and/or excessive clenching of the jaw A removable intra-oral appliance can be made for you called a nightguard or bruxism splint. The mouthguard protects the teeth from the forces of clenching and grinding the teeth together. A mouthguard or nightguard is more practical for treating the night grinder. At Powassan Dental Centre, our staff can fabricate a protective device for the mouth, that covers the teeth and gums to prevent and reduce injury to the teeth, arches, lips and gums. A mouthguard is most often used to prevent injury in contact sports such as hockey and football. 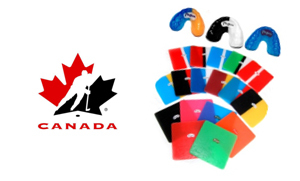 We offer many different colours for your mouthguard., including glitter guards, tye-dies, 2 tone colours, 3 tone colours, fluorescent guards and fangs. Call our office to discuss your needs. 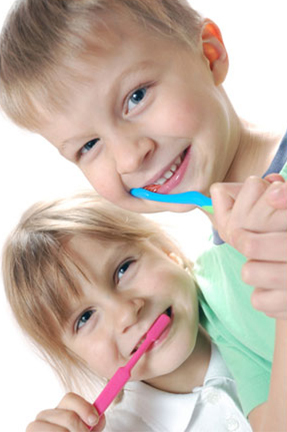 Our trained and knowledgeable dental hygienists, are happy to go over how to brush your teeth and how to floss your teeth with you and your children.